You have to read what this mouse is getting in the free section. It cracks me up. Our challenge at House Mouse andFriends Monday challenge is always Anything Goes with an optional theme chosen by our hostess. Please read the rules at the HMFMC blog. The prize from Pizzazz Aplenty is a surprise package of Embellishments and Dies. Great card Bunny and wow what a bow sweetie !! Love your card! The mouse is so cute and that bow is just lovely! Free, stale donuts? I’m sure my kids will empty them in no time. Haha. It really is funny Bunny. 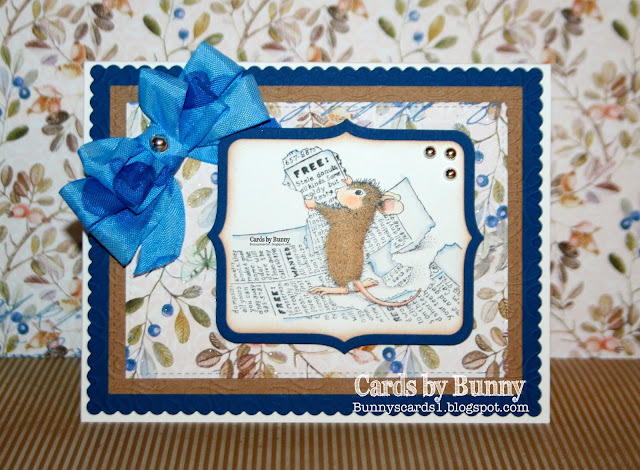 I always love the humor in all the House Mouse Stamp’s. Lovely touch of that big bow bow and nice blue and kraft color combo. I wish you a lovely new month and may the Lord’s blessings filled your home this Easter Sunday and every day Bunny. Take care. Hugs. This card is so cute. I love what the ad says, thanks for bringing that to my attention. Awesome colors and the bow is beautiful.